How does Mango care for his E46? You just bought your non-M E46 (323/328, 325/330) and you are probably wondering: What do I do now? Lets start with the basics on how to make sure your E46 is BULLETPROOF for years to come. These are very common failure areas for the E46 and they WILL leave you stranded. Fortunately, it doesn't cost that much to bring your E46 to roadworthy condition! Right off the bat, the first thing I did when I bought my E46 was throw away whatever battery is in the trunk. Unless you have receipts proving the battery is newer than 5 years old, replace it. A weak battery is known to cause many problems with the electrical systems in the form of cluster lighting up with warning lights to the car randomly doing other electrical-related things. The most obvious one is your car not starting. 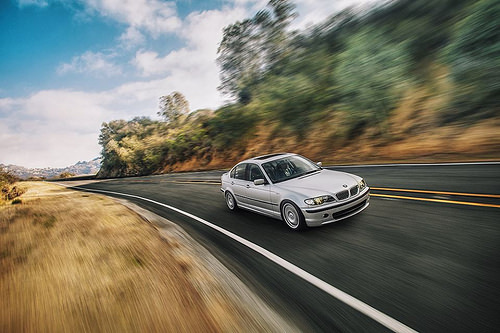 The E46 relies heavily on proper voltage or the electronics tend to be unreliable. This is one of the few parts you should get at Autozone or Walmart. Group size 94 or size H8. The voltage regulator is located on the back of the alternator. It regulates voltage to ensure proper operation of the electrical system. Basically by around 6-10 years, they start to fail. This will kill a new battery. Replace it.This one is a bit tricky because you'll have to pull your alternator out to know which kind you need. There's a rounded D-shaped connector and squared off rectangle connector. Pray you have the squared off rectangle connector because it's cheaper. The D-shape connector is found by searching under the BMW Z4. If you want to buy a rebuilt alternator, check out alternatorpros.com. This must be replaced. It can drain your battery (killing it permanently no matter how new or old it is) and cause your blower to blow inconsistently or not at all. Replace it. Don't be stuck in the summer time with your AC refusing to blow cold air or worse yet a completely dead battery all because you wanted to skimp on $45! Mobil 1 0W-40 Engine oil - Approved by Mercedes Benz, Lexus, Porsche, etc. German Specification. Change your engine oil and filter anywhere between 7,500 and 12,000 miles. You can likely go up to 15,000 miles without any problems as our cars hold 7 quarts, however for peace of mind, follow the 7,500-12,000 guideline. Per the BMW owner's manual, you should check the oil level 5 minutes after a hot engine has been shut down. The dipstick is calibrated to read accurately after 5 minutes has passed. Note: If you track your car, love to drive in a spirited matter, and/or experience lifter tick noise, it is common practice to overfill by one quart for a total of eight quarts. You can use any OE-spec parts store filter in a pinch, but I recommend using Mahle or Mann OE-quality/OEM filters. Don't skimp here. This is the lifeline of your engine. OEM Mahle. If your upper intake boot has an "F" connector with a vacuum line attached, your car has the integrated fuel pressure regulator. Most E46s come with this. I believe the M56 SULEV 325 cars use the plain in/out filter. Do this every 50,000 miles. These should be replaced at roughly every 15,000 miles. Couldn't find a DIY, but personally I recommend cleaning it. From the outside (front) mine appeared to be spotless. The backside was a VERY different story. Use throttle body cleaner. Requires removal of the airbox, upper and lower intake boots, and electrcial wire junction box. Four bolts hold it on. Replace the rubber throttle body gasket. This part can also cause vacuum leaks. It works by altering the volume of the intake manifold depending on engine operation/speed for optimum power and torque under all driving conditions. This system is part of the heart and soul of the BMW M54 powerplant. Don't skimp here. Remove and inspect yours to ensure the flap is not loose. You should feel resistance as you manually operate the flap. There should be no excessive noises or rattling. Some also use Motul for more serious heavy-duty driving. Major source of leaks. If the front or passenger side (right side) of your engine is covered in oil, then your valve cover gasket is leaking. By 60,000 miles, these are hard, dry, and brittle. Use Permatex Ultra Black at half moon areas and vanos seams. LESS IS MORE. Use very little sealant. Don't forget the 15 rubber grommets: part number: [B]11121437395[/B]. Up to 9/02, part number [B]11129070990 [/B]and 9/02+: [B]11120030496[/B]. If you experience repeated leaking, your valve cover could be damaged or warped. Major source of MAJOR leaks. The left side of the block will be wet and you'll have puddles in your driveway. Replace when leaking. Also trim and re-clamp (using new universal clamps) the power steering lines to the bottom of the reservoir and to the return line at the pump. The BMW clamps get loose over time and oil leaks/seeps out. Of course, clean the exterior/interior and engine compartment. There's nothing worse than a dirty car with an engine compartment full of leaves, debris, oil, spiders, and dead rats. Cleaning also can help reveal problem areas or parts that are leaking. A clean engine is also more satisfying to work on. These are the absolute bare essentials to have a nice running and decently reliable car. It doesn't stop here though. Links or products subject to change. Research your particular vehicle, part numbers, and/or needs for your application. Thanks for the awesome articles! I just bought a used 2002 330xi for $3100 and it has 154,000 miles. The previous owner looked to have maintained it relatively well but I am taking your recommendations and, without documentation in hand, replacing many of the components you talk about. So far I have replaced all the filters, oil changed, oil pressure sensor, oil level sensor, O2 sensors cleaned (might replace them later), the valve cover gasket (found oil on the block passenger side) and the windshield cowling which was falling apart. My next challenge is replacing the clutch/flywheel, main rear seal, transmission seals (manual), and the shifter detent pins including the shifter bearings. The cooling system seems fine but I will definitely replace the expansion tank and thermostat ASAP and possibly the radiator although I might wait until next spring for that. One of the control arms are and so both are ordered and finally the front struts are overdue for replacement. She still drives great and I am confident that through the summer as I replace small things she should be ready for the next 150,000 miles! Thanks for the great articles. Are there any items unique to the xi series that might need consideration like the transfer case? What are your thoughts?